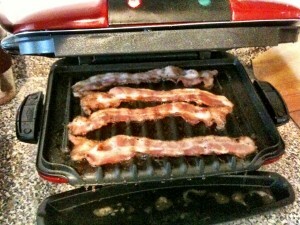 If I am only making a few slices of bacon, my George Foreman Grill is the absolute BEST way to do it. Since I’ve started eating low carb, I’ve found the joy of eating bacon again. I can put the grill on high heat, put three or four strips of bacon on the grill and set the timer for ten minutes. When I’m done, most of the grease has drained into the pan under the grill and the bacon only needs a dab of a paper towel to be perfect. It’s ideal: no turning, no draining the grease and no grease splatters all over the stove. However easy the bacon is to cook on the George Foreman grill, I was still reluctant to write this entry. Here is a tip to make cooking bacon easy, clean and fast, and yet, I was unwilling to post that picture of my own grill stacked high with bacon. Why? Because bacon has been considered an evil for my entire life. High in fat and calories, bacon was a guilty pleasure for me. It was avoided when I was “on program” and a binge-worthy desire when I was off. Now that I’m eating low carb, bacon can be an every day breakfast. I can’t even write the words that I should write: bacon is a HEALTHY breakfast. I’ve lost TWENTY pounds since I started eating low carb in June. That’s TWICE as much as I lost all last year while I was starving on Weight Watchers. That kind of reduction in weight is considered a GOOD thing for my health, and I did it by eating plenty of bacon. So, YES! Bacon IS a healthy breakfast. I should feel no shame in writing that, yet it goes against everything I have been told for my entire life. Of course, everything they told me ended with me starving and paradoxically obese, so maybe it’s alright to just do my best to put all that old “wisdom” out of my mind. 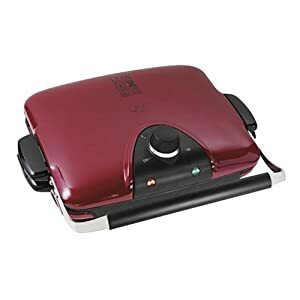 If you want to easily cook bacon, here are a selection of George Foreman Grills at Amazon. My favorite is the first one (pictured at the right) and lucky you, it’s MUCH cheaper now than when I bought it several years ago.